Carmelo Anthony’s 42 points 9 rebounds and 5 assists were not enough for the Knicks to defeat the Miami Heat in a potential first round preview. While Carmelo was huge, there was little help to be had from the rest of his team, with only J.R Smith reaching double figures. LeBron James and Dwyane Wade carried the Heat, scoring 29 and 28 points respectively. Chris Bosh also finished with 16, but more importantly out rebound Tyson Chandler as he played the center position, pulling down 14 boards. Three players scored 20 points or more and Pau Gasol knocked down two clutch back to back threes in overtime as the Lakers swept the series between themselves and Dallas. With Kobe Bryant still ancient, the Lakers’ offense hardly struggled without him, albeit it did require big games from unusual sources. Dirk Nowitzki had 24 points but shot just 9-28 from the field. Jason Terry also had 21 points off the bench. Rajon Rondo had 20 points and handed out 16 assists as the Boston Celtics cruised to a win against the Charlotte Bobcats. With the Big Three staying home for the game, it was left to the younger brigade to take care of business. They did not disappoint, with Brandon Bass, Avery Bradley and Rajon Rondo all scoring 20 points. Greg Stiemsma swatted 6 shots for the Celtics. Gerald Henderson also had 22 for the Cats. After taking down the Boston Celtics, the Toronto Raptors claimed another top Eastern scalp as they defeated the Atlanta Hawks by 18 points. Demar DeRozan had 23 points but the Hawks shot themselves in the foot, only hitting one three for the entire game. Josh Smith lead all scorers with 26 points on 11-20 scoring. The Detroit Pistons pushed the Bulls to overtime but could not finish the game off as they lost by six. Rodney Stuckey lead all with 32 point. Derrick Rose continued to struggle in his retun, scoring 24 points on 9-22 shooting. Joakim Noah also had 20 points and 17 rebounds including a phenomenal 13 offensive rebounds. 4 starters played 20 minutes plus for the Bulls. 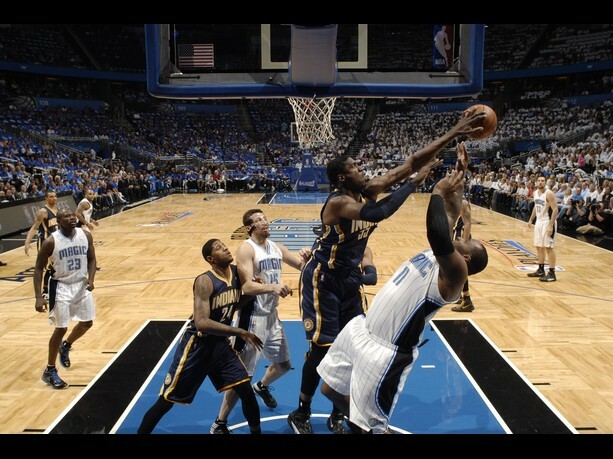 The Orlando Magic got the win butlost another bigman as Glen Davis went down with a big knee. The injury leaves the Magic with only one slight tall player left in Ryan Anderson. Jameer Nelson had 21 and 9 assists as well as 9 rebounds to lead both teams. Antawn Jamison had 21 for the Cavs. Marcus Thornton Knocked down the elbow jumper to win the game with 3.4 seconds left. Thornton had 20 points to go along with the game winner. Wesley Matthews was the highlight for the injury torn Trailblazers, scoring 31 points on 8-10 shooting from downtown. 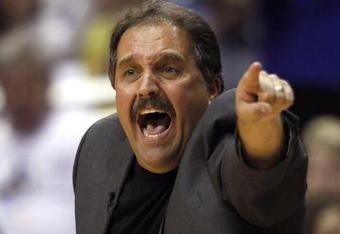 The New Orleans Hornets had a hige upset as they beat the Memphis. Rudy Gay had 24 points in the loss while Eric Gordon lead the Hornets with 18. Carl Landry had a double double off the bench registering 16 points and 11 boards. Afflalo and Ty Lawson both dropped twenty points and Andrew Miller hadned out 11 assists off the bench as well as 7 boards as the Denver Nuggets defeated the Houston Rockets by a comfortable 15 points. Chase Budinger had 19 off the bench for the Rockets. The Toronto Raptors got a giant upset as they beat the Boston Celtics, ending the Celt’s 4 game winning streak. DeMar DeRozan had 22 to lead the way for the Raptors, on 13-13 shooting from the free throw stripe, while Rajon Rondo’s assist streak continued as he handed out 12 of them. Marshon Brooks had 22 points and Gerald Green had 23 off the bench as they handed a loss to the seriously slumping Sixers. The 76ers were outscored 32-23 in the last quarter as the were overwhelmed by a determined Nets team. Jrue Holiday had 19 for Philadelphia. Tracy McGrady had 11 points on 5-7 shooting and was a +31 on points differential as TMac and the Hawks went to Orlando and came out with the win. 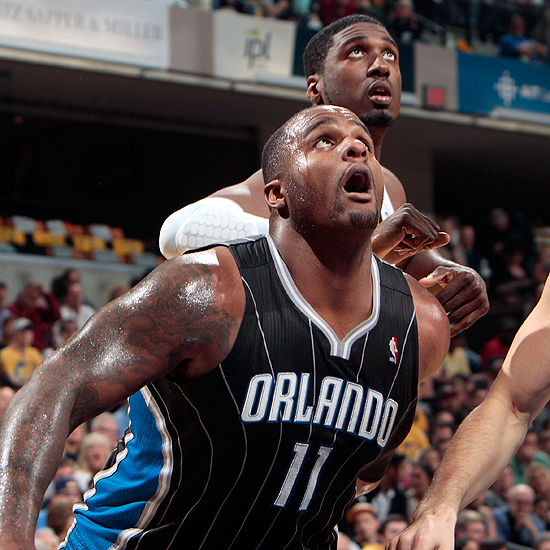 Filling in for the sizable absence of Dwight Howard, Glen Davis had 16 points and 9 rebounds to lead the Magic. 12 of the Pacer’s players came onto the court and all but 2 scored as the Pacers took down the Cleveland Cavaliers by 19 points. 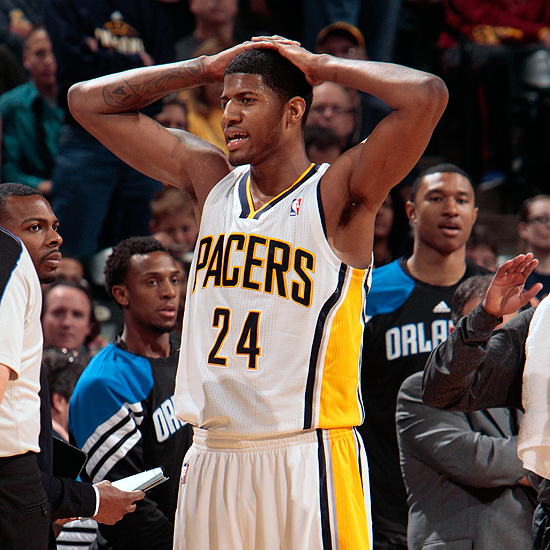 Danny Granger had 18 to lead all scorers while Omri Casspi had 14 for the Cavaliers. The Washington Wizards found a solid brick wall awaiting them in Madison Square Garden as the left New York with their tail between their legs, losing by 38 points. JR Smith had 23 points in the huge Knick’s win, as Steven Novak, Carmel Anthony and Baron Davis all had 18 points apiece. Jordan Crawford had 17 to lead the Wizards, by shot appallingly, as did most of the Knicks team as they shot 28 percent from the field. Dexter Pittman had 16 points off the bench and 11 players scored for the Heat as they beat the Charlotte Bobcats. 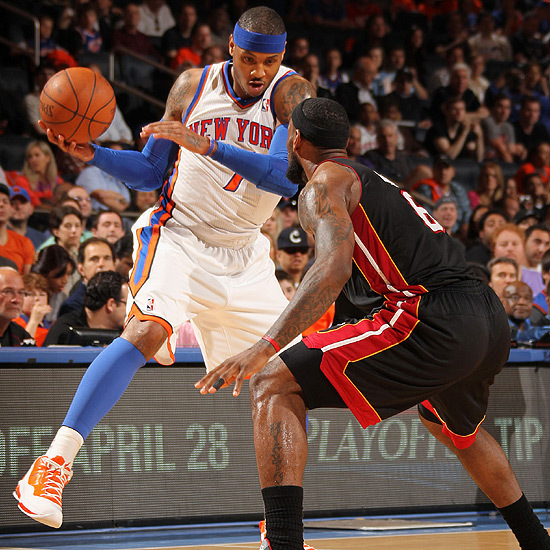 LeBron James also had 18 points to lead the Heat. 2nd year forward Derrick Brown had 21 points to lead the Cats. Brandon Jennings’ 20 points and 10 assists as well as Drew Gooden’s 26 points led the playoff chasing Bucks to a victory over the Detroit Pistons. Rookie point guard Ben Knight had 25points to lead the Pistons. Paul Millsap had 17 and Al Jefferson had 19 but it wasnt enough as the Jazz lost to the New Orleans Hornets. Eric Gordon had 25 to lead the Hornets. The Phoenix Suns stayed hot in the race for the playoffs as they took down fellow competitor Houston by7 points. Marcin Gortat had 20 points in a captivating, and at times fiery, duel with fellow international Luis Scola. Scola had 21 for the Rockets while Goran Dragic had 22 points and 7 assists. Kevin Durant had 29 points and pulled down 9 rebounds while Serge Ibaka blocked 7 shots as the Thunder cruised to a routine victory over the Sacramento Kings. Andrew Bynum matched his rebounding numbers with scoring as he poured in 20 points and 8 rebounds as the Lakers solidified their place in the playoffs. Still without Kobe, Matt Barnes had 24 and 10 to help fill the void. Andre Miller had 20 to lead the Nuggets. Delonte West and Dirk Nowitzki had 21 and 24 points respectively as the Dallas Mavericks beat the Portland Trailblazers by 3. Nicolas Batum had 20 points for the Blazers in the loss. 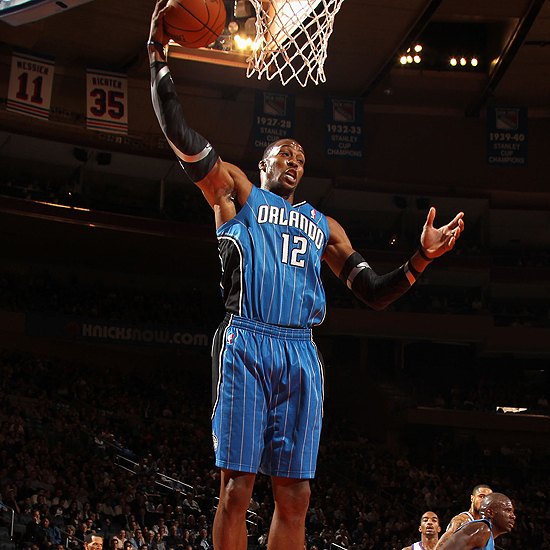 Despite Dwight Howard returning to the lineup, the Magic lost to the New York Knicks by 16 points. The Knicks had 41 points off a 4 man bench while Melo had 19 to lead both teams. Tyson Chandler continued to prove that he is possibly the only big man to truly slow Dwight, holding the all-star centre to just 8 points. John Wall’s 28 points and 10 assists were not enough for the Wizards to beat the Detroit Pistons as they went down by 99-94. Greg Monroe had 18 points while Rodney Stuckey had 15 points off the bench. The Celtics were overrun in the second half by a determined Chicago Bulls outfit by 7. The Bulls recovered from their slow start to completely dominate the second half, with Luol Deng’s 26 points leading both teams. Paul Pierce scored 12 in the first term to spark the hot Celtics start but faded to finish with 22. Chris Paul had 13 points 8 assists and 5 steals as the Clippers survived a hectic final few minutes to beat the Sacramento Kings. Rookie sensation Isiah Thomas had 17 points for the Kings while Randy Foye had 20 for the Clips.